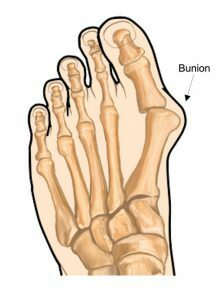 This page will provide you with information about bunion surgery. For further details, please speak to your consultant. Bunions are hard lumps associated with the big toe joint nearest to the foot. Sometimes bunion sufferers also have arthritis in the same joint. The development of bunions is often associated with wearing ill-fitting shoes that do not allow enough room for the toes. The main benefit of surgery is the straightening of the big toe, allowing footwear to fit more comfortably. Wearing carefully selected footwear will make the bunion more bearable, however the problem can only be corrected surgically. An operation usually takes less than an hour. Your surgeon will adjust the tightness of the ligaments to realign the toes. There are various anaesthetics, which will be discussed with you. Most patients can return home the same day or the day after surgery. The affected leg should be elevated for a period of one week after surgery to allow the swelling to settle. Your surgeon may decide to put your operated leg in a plaster cast for a few weeks and it is likely that you will require a walking aid such as elbow crutches to assist you until the pain and swelling subsides. You may continue to exercise regularly in order to facilitate recovery, but consult your GP or healthcare team before you begin exercising. You will be able to wear normal, soft footwear after the swelling goes down. This is likely to happen approximately six weeks after the operation. If you find that a bunion is causing you discomfort, surgery should result in a straighter big toe. You should also be able to wear normal shoes more comfortably after surgery. Price for this procedure from £3800.